It's time for the New Product Launch! All the Stamps, Die-namics, and Stencils can be found HERE. Please remember to visit each of the MFT Designers' March New Product Launch posts on the MFT Blog and leave a comment by the end of the day on Thursday, March 9 for your chance to WIN one of two, $100 Gift Vouchers. Ready? Set. Comment! I have a couple of sweet baby cards to share with you today. 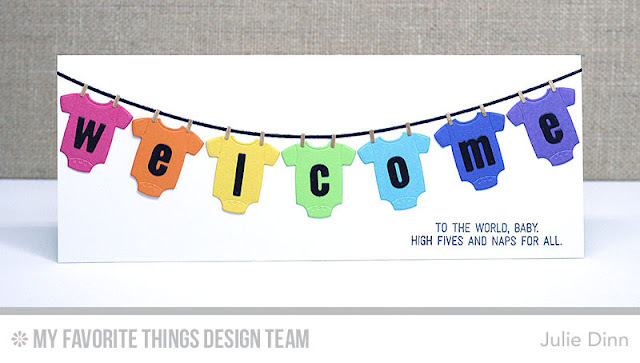 They both feature the fabulous Welcome, Baby stamp set and Bundle of Baby Clothes Die-namics. These sets are both going to get a ton of use in my house. I LOVE them! My first card is full of bright and cheery onesies. 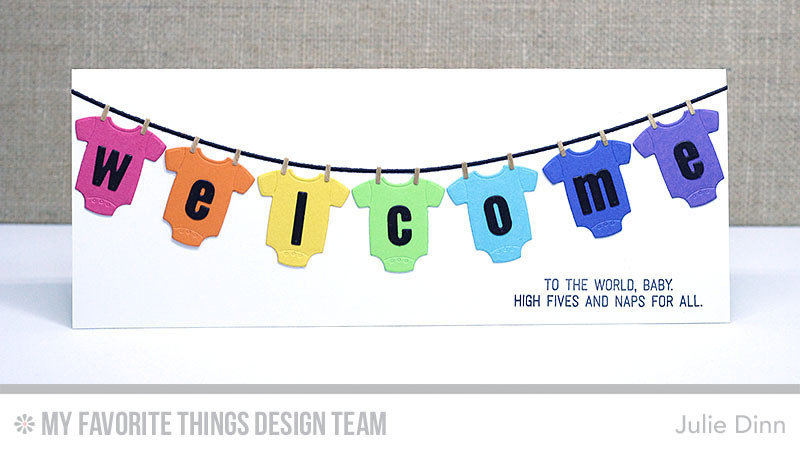 I die-cut the onesies in an assortment of card stock and added a little letter to each one to spell out welcome. For the next card, I wanted those sweet denim overalls to be front and center. Seriously, how cute are they? I die-cut the overalls from a Denim Sheet, the onesie was die-cut from a print in the Lucky Prints Patterned Paper Pack, and the t-shirt was die-cut from Smooth White card stock. SQUEE! Love the Long card with the rainbow onsies Julie! Love the colorful line of onesies! Great idea to personalize with baby's name. I love how you used denim for one card, and the onesies for the welcome message. What a super cute card. Adorable cards! Love the rainbow one because I'm a sucker for anything in rainbow colors! I love your clothesline cards! They are so cute! Fabulous cards! Your clothesline is very creative and inspirational! Great cards. Love the clothesline. What a creative idea. great cards! Love the use of these baby clothes! Your cards are super cute!!! 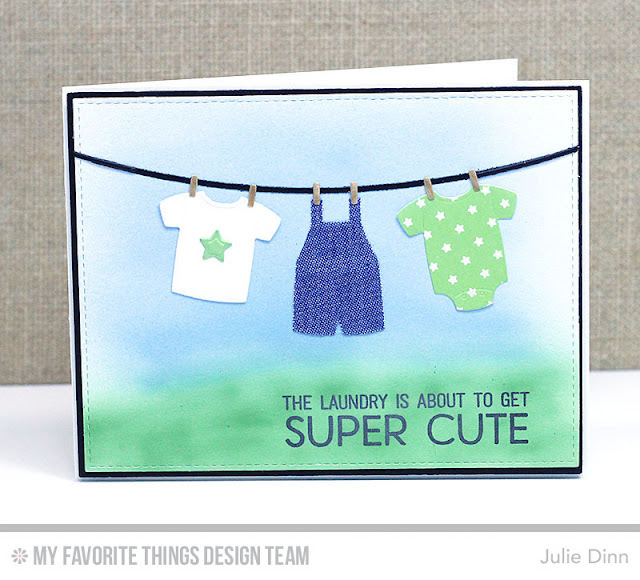 Those 2 cards are "super cute"
I just love your cards, the clothesline with the welcome letters is so genius! Thanks for the great inspiration. Oh my goodness!!! Such adorable cards!!! Very very cute!!! \Two adorable baby cards! I love them! Super cute cards and great inspiration. So cute! Those onesies are adorable. Adorable. I am in love with the first card.Amazing idea! Thanks for inspiration! Love the colorful onesies banner and the denim overalls. Cute baby cards! Thanks for the inspiration. They are too cute. Thanks for sharing. Super adorable cards. I love the sentiment on the 2nd one ... would be a fun way to tell someone you're pregnant. These cards are so adorable! I am crazy about the unique sentiments. Very cute baby cards...these onsie are adorable. Great cards. I really like them both. My favorite is the welcome one. Love your use of the onsies. awww... super cute set of cards!! Really nice cards! I love the first one. Oh, so adorable!!! These are both just fabulous! And super cute! Such cute cards- just love this new release! These are the most adorable die cuts I've seen in a long time. The cards you created really highlight them. Such cute cards. Love how you spelled out "welcome" with onsies. I so need some new baby stamps and dies for cards! Fabulous! Both these cards are super cute. Love the way you blended the background on the laundry one. These are SUPER Cute! Love the rainbow onesies...that's the cutest. Fabulous! I don't have the 'right' words to convey how I marvel over the magic you create with MFT products, so I'll just express a genuine, deep WOW! Your baby cards are stellar, especially the rainbow onesies! Smiling brightly and feeling inspired! Love your projects--especially the first one! Just too cute! Super cute indeed, especially the first one. I tend to forget that I can adapt the size of my card to the design instead of the other way around. Cute as can be! Love the colors!